This superb holiday villa, set in a privileged position, underwent a long and careful refurbishment aimed at letting the ancient character of the house together with the modern facilities required nowadays. The careful selection of the most sophisticated details (objects, furnishings, tableware…), and the installation of all possible comforts will ensure that a stay in this refined place is unforgettable. This house is "easy" and feels "like a home", almost "familylike" due to its warm atmosphere as well as to the distribution of the rooms and leisure areas. Classic harmony blends in with modern comforts: these carefully selected ingredients are the magic formula to this enchanting place. This follows years of research into the positive energy of objects, colours, greenery and space! The property's valuable equipment includes wood and terracota flooring, pleasant air conditioning system throughout the house, turkish steam room to be used with aromatherapy oils and a heatable private swimming pool. In addition, each of the 5 bedrooms is equipped with is own shower room with one of the bedrooms being suitable for the disabled. Lower floor: Open plan kitchen / living area boasts a large wooden table. It is very well appointed (fridge/freezer, dishwasher, microwave, large hob and oven, blender/juicer, kettle, toaster, 2 coffee machines, wine glasses, all types of pans, etc) and also includes a particularly pleasant fireplace for the colder seasons. In the living area you will find a satellite TV with dvd and home cinema. The new construction of the building comprises a reception area with a desk (ideal for those who need to catch up on some work)and guest shower room, turkish steam room for 2 people and a twin bedroom with ensuite bathroom. In order to help people with mobility problems, the ground floor has no steps and the ensuite bathroom of the twin bedroom has been specially constructed for wheelchair users - with enough space to move a wheelchair. The access from the car parking area is done through a slope of about 6% inclination all the way to the front of the villa. The swimming pool has built in steps making the access much easier than the aluminium ladders. 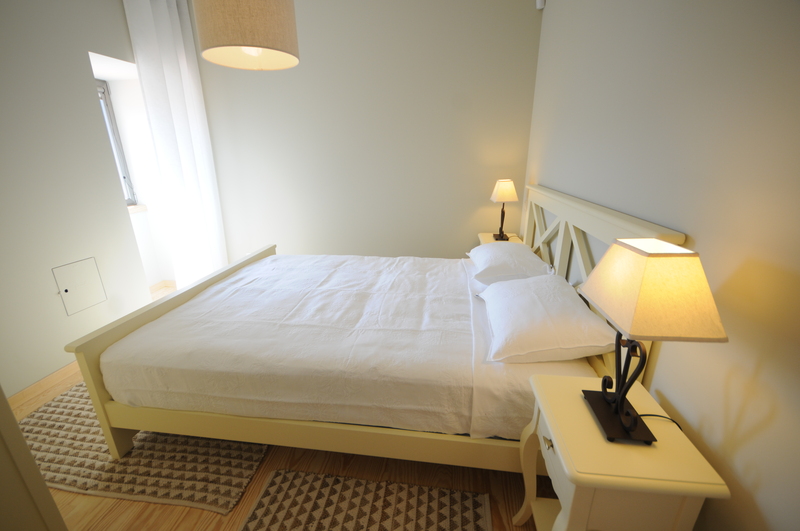 Upper floor: 4 double bedrooms of which 2 have double beds and the other 2 have twin beds. Each bedroom has an ensuite shower room. Ample sunbathing terrace, lawns and mature gardens. The external sitting areas include a large covered confortably furnished terrace, with dining table just outside the kitchen. Private salt water swimming pool (10 x 4.5 metres and depth from 1 to 1.90 metres), grass children's playground, grass sports area with football goals, volleyball and badminton net. Pool heating is 200 Euros per week.